An inspirational and insightful weekend started with the plank. Many readers may guess from this which Master led us during the warm up as we kicked the first session off. As we had lined up it was great to see such an international flavour to our group, with representatives from not only UK ITF but also from Ireland and Germany. I confess that, as I tried to keep up with the variety of planking activities, a certain sense of foreboding for what lay ahead began to creep into my mind. Which proved completely unfounded. Don’t get me wrong, by the end of our two days I was left in no doubt that I’d been training and I was left feeling that satisfying ache you get after you’ve trained hard and enjoyed it. But at no point did I ever find myself regretting my decision to attend and the weekend was a great experience. And so looking back, my summary would be unequivocally – if you get the chance to attend one of these weekends then do. You won’t regret it. 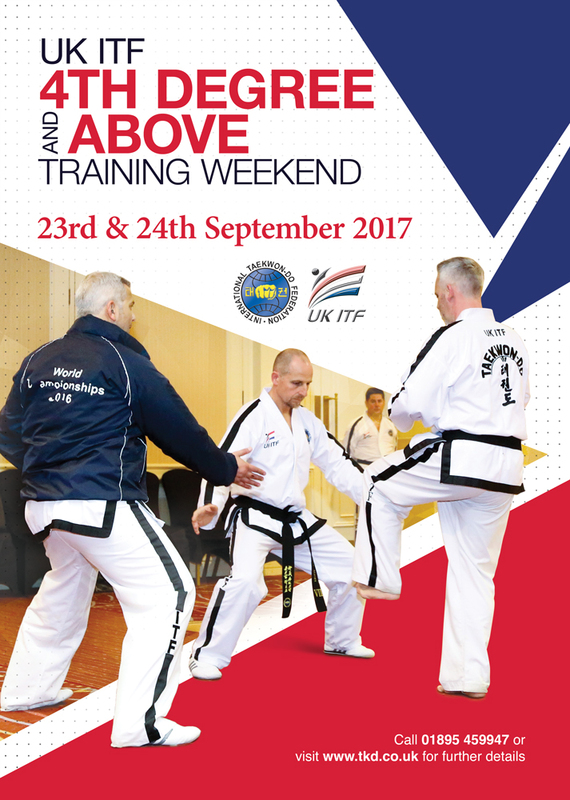 The ethos of the weekend is undoubtedly about equipping everyone to perform to the best of their abilities and take away ideas and knowledge to share with their students (if instructors), club mates and other practitioners. After our warm up we spent much of Saturday working on 4th degree patterns under the tutelage of all of the masters present; with Grand Master Nicholls leading the session and Master Wood, Master Gassor, Master Horan and Master McCarthy helping students throughout. And the format for the 4th degree patterns proved the template for all the patterns focused on over the weekend – performing the patterns in instructor’s time, in our own time and then break out sessions spent focusing on various specific moves within the pattern just practiced. These sessions often involved working with a partner and this added to the sense of camaraderie that was evident across the whole weekend. Saturday evening saw a number of groups make the most of the restaurants in the Quay area of Poole and a good meal, spent in good company, certainly felt like it had been earned. Sunday’s training, where we were joined by Master Chand and a number of his students, focused on not only 5th and 6th degree patterns (the latter giving the Masters a chance to practice Tong Il with Grand Master Nicholls), but also sessions on semi free sparring, foot sparring and a final session revisiting correct measurement in 3 step sparring. As with Saturday’s training everyone was encouraged to ask questions, share their thoughts on what we were doing and make the most of all the aspects of training we covered. And whilst everyone worked hard it was all carried out in a relaxed and friendly environment. It was a real privilege to spend time with the masters and other students present over the weekend and I’m already looking forward to doing it again when the next one comes around.